Big Block From Hell Series: Modifying a 1971 Corvette - Vette Magazine's "Big-Block from Hell" articles make up the longest running project car series ever published by a Corvette magazine. 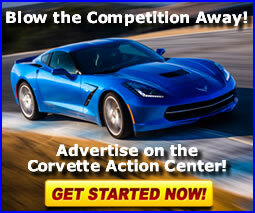 Buying a Corvette: Buying your first Corvette can be a difficult task if you're not sure what to look for. This article and handy checklist can make it a lot easier. Care and Detailing: A collection of articles regarding the proper care of a Corvette, from washing, waxing to storing and tire storage. Data Center: The Corvette Data Center contains performance numbers, production numbers, specifications, service bulletins, recall notices, tech info and more for all Corvettes since 1953! Demographics - 2009: The following article was released from the Specialty Equipment Market Association (SEMA) and outlines statistics and demographics for Corvette owners across the United States in 2009. Featured Articles: We've compiled a listing of special articles and product evaluations that have been featured here on the site over the years. Many of these articles are in various parts of the site, but this listing should be helfpul in finding those articles for you. Gallery: This section of our site compliments our Corvette Data Center and is one of the most comprehensive collections of high quality Corvette images on the web. How-To Articles: The Corvette Action Center's Knowledgebase contains how-to technical articles submitted by Corvette Action Center members for various Corvette model years. Knowledgebase: The Corvette Action Center's Knowledgebase has the most extensive collection of Corvette related service bulletins, recall notices and technical articles on the web. Motorsports: For those of you into racing and autocrossing your Corvette, this section is for you! Along with a couple articles detailing the Corvette C5-Rs at the Rolex 24 Hour Endurance races of 2001 and 2002, we've compiled a listing of helpful racing links and a large listing of drag strips and race tracks througout the United States. Owner Research Center: Everything you need to find original documentation for your Corvette including articles on build records, Department of Motor Vehicle contact information and the ability to post information wanted ads. Product Reviews and Evaluations: An extensive online database of product reviews submitted by Corvette Action Center forum members as well as in-depth product evaluations submitted by automotive journalists and industry professionals. Quiz Center: Not sure how to properly repair body damage on a 1953 Corvette, or repair the convertible top on a 1986 Corvette? Test your technical expertise here! Road Tests: This section will highlight various Corvette road test articles that have been written by Hib Halverson and other automotive journalists. Storing a Corvette: One of the most popular questions among Corvette owners is "how should I prepare my Corvette for long-term or winter storage? this four page article is just for you! Toolbox Calculators: An extensive listing of online automotive calculators including purchasing and financing calculators, engine and chassis calculators as well as helpful charts and links.